Not many baseball-related sets make me say...wha? But you can believe this one did. 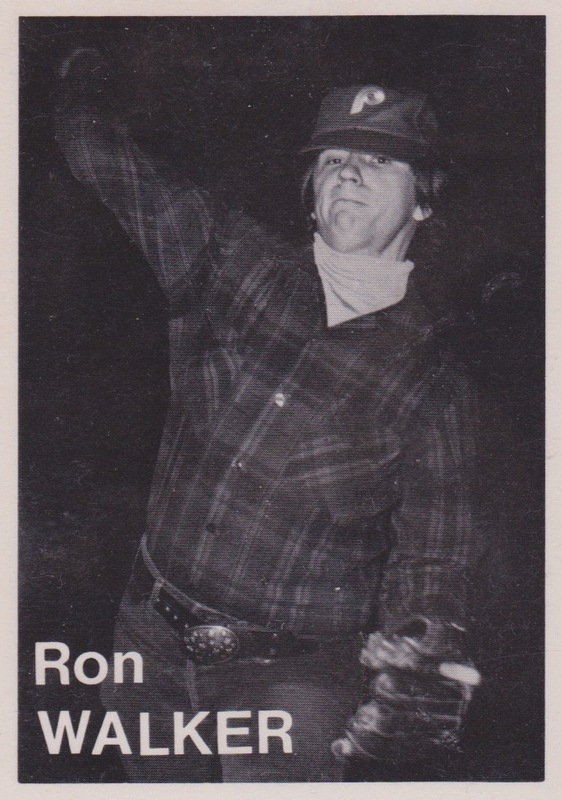 Because, c'mon, who is this plaid-wearing, belt-buckling, 3/4-arm-angle Phillies right-hander? 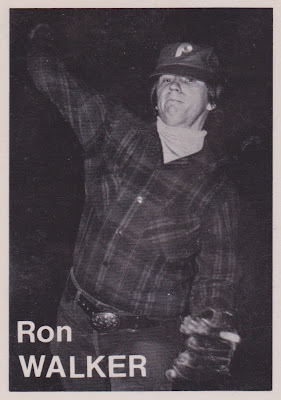 And is he a prospect from the independent Lumberjack League? 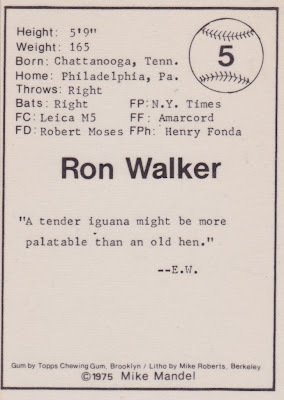 Baseball-Reference.com records one Ron Walker (and two Ronalds) as pro ballplayers, but you're looking at a different kind of professional here. This Ron Walker, native of Chattanooga, made his money from the other side of the lens as an artistic photographer. Artist Mike Mandel created today's set of 135 "baseball-photographer" cards as a satirical comment on the commercial world's consumption of "real" artists. Everyone pictured studied fine art seriously and has work hanging in museums, in contrast to the throwaway image of mass-produced cardboard originally created to sell plastic slabs of chewing gum. Mandel contracted with Topps to package 10 of his cards with their gum in wrappers, hence their byline in the back text. Thanks to a profile by Shane Lavalette, I found Mike's own commentary on the set's origin. "This is a first edition of all 134 Baseball-Photographer Trading Cards (plus one checklist, 135 cards in all)...Texts, statistics and quotes by the respective artists printed on verso. Each card 3-1/2 x 2-1/2 inches. 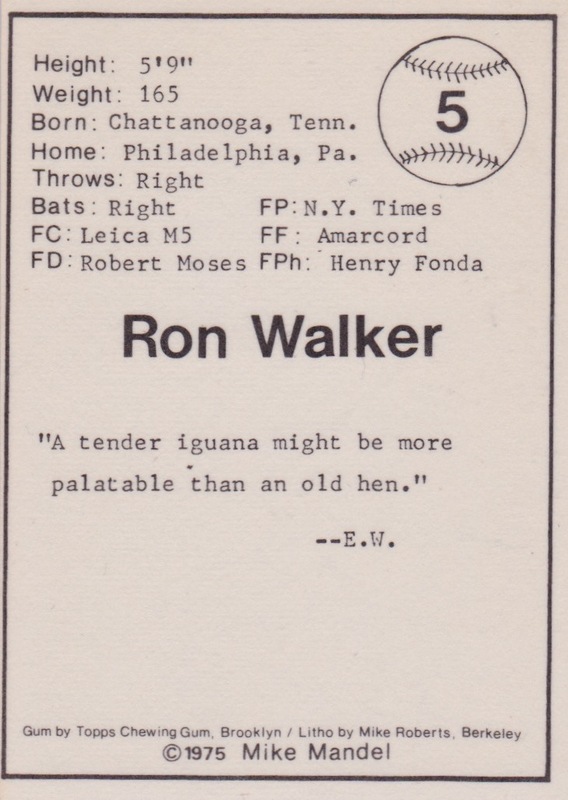 The reverse side for each card enabled the photographer to fill in their own personal data that referred to the information usually included on real baseball cards. In a sense, each photographer’s response provides an insight about how they approached their participation." This perspective's a level removed from typical 1970s bubblegum work, but still became a collectible in its own right. 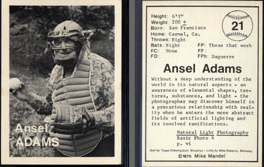 My favorite card (for both image and fame) is Ansel Adams in full catching gear. Value: I obtained this #5 on eBay for $10 + shipping. Fakes / reprints: Haven't seen any in the marketplace. Not sure how many would consider this a baseball set worth faking, high price tag or not. That's quite a set. Come for the baseball cards, stay for the mustaches.